Many people refer to this scene as "alpenglow", since you can see the color of the sun glowing off the mountain. I, instead, have decided that this particular phenomenon shall be renamed as "Cathedralglow". 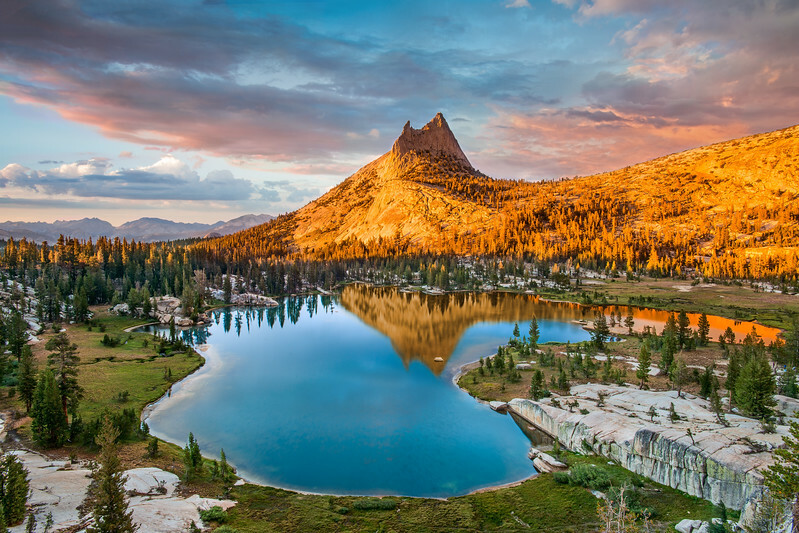 Named after the sun reflecting on Cathedral Peak in Yosemite National Park, Cathedralglow occurs when the sun is just below the horizon. Thunderstorms hovering over Cathedral Peak also pick up some of the color of the setting sun. One thing that I like to do with my each of my posts is to tell the story behind the photo and this one (I think) is a good one! This particular story involves the flu, long hikes, rock bouldering, cops, meteors, and more. I woke up on this particular morning with absolutely no energy. A large breakfast didn't help either and I started to get worried because I didn't know when we would eat again. As the day wore on I felt worse and worse. I started getting the chills. I had a fever. I had no appetite. I didn't want to move. It was only getting worse. I took a nap. Finally we stopped at the general store and I bought some DayQuill and a hamburger. I took another nap. When I woke up, all of a sudden … I had energy!!!! Just in time too -- it was 5 minutes before we were set to leave for Upper Cathedral Lake! Off we went! We left with plenty of time to hike the 4 miles, scout and wait for sunset. We didn't plan that I'd be sick, nor did we realized we would get lost and find ourselves climbing up hill more often than not but we arrived at Upper Cathedral Lake with plenty of time. When we arrived our jaws just dropped. Man is this place beautiful! After climbing around, walking over rocks, and doing a bit of bouldering we found what we wanted. Except … we were 100 feet too low! Above us loomed a huge rock-cliff. From down below, the lake was too small and squished; we needed to be on top to view the lake properly. Luckily Willie and I have both rock climbed at some point in our lives and we arrived at our spot with enough time for me to take another nap. As we waited for sunset some beautiful clouds rolled in and it started to rain behind Cathedral Peak. Man were we getting excited! As the sun dipped below the horizon the mountain peak just lit up with Cathedralglow! Wow were we in for a treat! As had been typical on this day, our emotions went up and down, up and down again; much to our dismay a number of thick, dark clouds rolled in and only a touch of pink color appeared in the clouds. That's when we turned around and saw the sky behind us was on fire! I had absolutely no energy to sprint down the cliff to get a better composition so we turned and just watched the wonderful sunset with our own eyes (and maybe a few shutter clicks too). It was a long hike down and thanks to another DayQuill I made it safely back to the car. This night was supposed to be the Perseid Meteor Shower maximum and we were eager to get to Mono Lake to photograph the meteors. A park ranger, on the other hand, was not so happy with our eagerness and decided to quiz us on why it was a better idea to slow down before eventually letting us go with just a warning. We spent a couple hours photographing meteors and then I finally made it back to bed where a long sleep found me feeling much better the next morning.